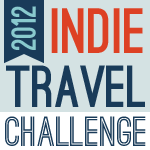 Remember last week’s entry about the 2012 Indie Travel Challenge? It’s time for Week #2, baby. Are you an indie traveler? What do you think makes someone an indie traveler? What does indie travel mean to you? Some types of titles I welcome more readily into my life. I like any instance when I’m described as Wonder-Woman-esque. I am a hot beverage drinker (hot cocoa, coffee, tea – I don’t discriminate) I’m a Capricorn. It is easier to live within the boxes & the labels we have chosen ourselves but it doesn’t mean that they are any less confining. I don’t really know if I’m an indie traveler – but whether or not I am, I still plan on continuing to travel & seek out the experiences that interest me. Maybe that’s one of the core beliefs – the personalized checklist. I want to stay at the Library Hotel in Manhattan. I want to pick a fresh mango. I want to see a kakapo. Wanting to see the things you’ve been told about your whole life as well as the quirky endeavors that have sculpted your personality isn’t indie or independent. It does, however, exhibit a drive oriented around self, connection, & fulfillment.